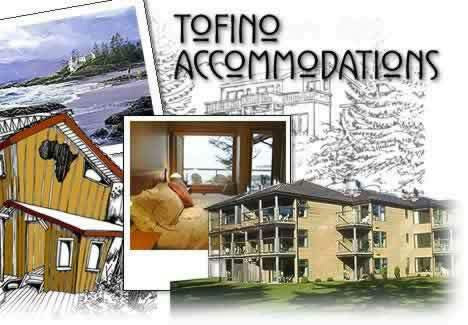 Tofino accommodation choices are offered to suit all tastes, budgets, needs and desires. From an economical campsite or motel & guesthouse bed to a 4 star hotel room that lacks nothing for indulgences Tofino can accommodate all. The styles of lodging available are incredibly varied. One might stay at a water front inn or bed and breakfast with the sound of the waves lulling them to sleep. There are many vacation rental homes that can accommodate families and groups. Many find themselves a room deep in the rainforest, quiet and serene with the scent of cedar in the air. For a central location the downtown core is thick with lodgings of all varieties, including Tofino hostel accomodations. There are many unique cabins located on islands, floats, and in remote locations. Combining a taste of adventure with your stay can create lasting memories at many Tofino accomodations. Tofino offers accommodation for every taste and budget: Links to tofino lodging like Bed and breakfasts, Tofino hotels and vacation rentals.